I headed over to my local fly shop today to pick up some hooks and there happened to be a fly fishing class going on. While I was scouring the hook wall trying to find some #16s, I was eavesdropping, listening to what the instructor was saying. And it was painful. The “class” listened in a zombie-like stupor as the instructor spouted off all kinds of statistics, formulas, complex vocabulary, measurements, numbers, facts about gear, and philosophies. When I turned around to check out, I could finally see their faces. They looked somewhere between bored and intimidated. It looked like a college lecture where half the students were daydreaming while the others were so afraid of failing, they were frantically writing down every word the professor said. Then, I remembered how I gave my wife a Tenkara rod and she immediately caught three fish on her first try with absolutely zero fishing experience. I immediately thought, “this is no way to learn”. Here these people are, in a class room setting being bombarded with technical information when they could be out on the stream catching fish right now! And given the fact that they probably spent a lot of money to take the course, I actually felt bad for them. Part of me wanted to sneak over there like a shady drug dealer, whip out a Tenkara rod and say, “Psst. You want to catch fish? I’ve got something right here that’ll catch fish”. To me, everything about the situation was wrong. 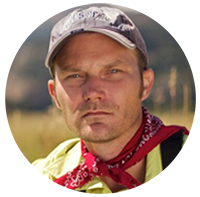 Why would someone who wants to fly fish start with the most complicated and confusing method? And, why would they start in a classroom? The stream is the best classroom. Most of us who fish Tenkara today did it backwards. 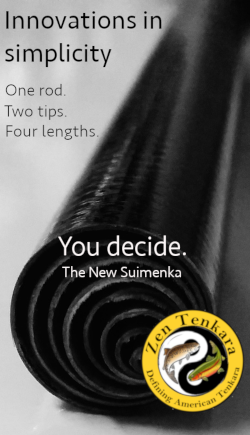 We started the complicated way and then gradually discovered the beautiful simplicity of Tenkara. We probably didn’t have much choice in the matter since Tenkara wasn’t really around when we started. But for today’s aspiring fly anglers, wouldn’t it make more sense to start with Tenkara, then learn the more complicated Western fly fishing style? Instead of spending hundreds (or thousands) of dollars on technical classes and complicated gear and not catch anything, why not spend $150 on a Tenkara rod and start catching fish right away (and, actually have fun)? I would gladly bet $100 that at least 50% of the people in the class I saw today will eventually give up on fly fishing. They will be discouraged by the difficulty, cost, complexity, and lack of fish. I have personally witnessed this phenomena countless times when I was an instructor. People tend to believe that if they spend enough money on instruction and gear, they will become successful anglers. Then, reality hits them and they give up. If I were still an instructor today, I would never put a Western rod in my students’ hands. And I would never start them out in a classroom. I’d hand them a Tenkara rod, head out to the stream, and make them fish. I’d build their confidence and motivation early on by getting them to catch fish right away. They can learn the technical stuff as they go. But to develop a passion for the sport, it has to be fun and rewarding form the start. If they wanted to progress (if that’s the right word) to Western fly fishing, fine. But don’t extinguish the spark before it ignites! Here’s a video of a group of beginners using both traditional and Tenkara fly fishing gear. Which one looks easier? If you’re thinking of taking up fly fishing, try Tenkara first. Courses and complicated Western gear are expensive and frustrating. 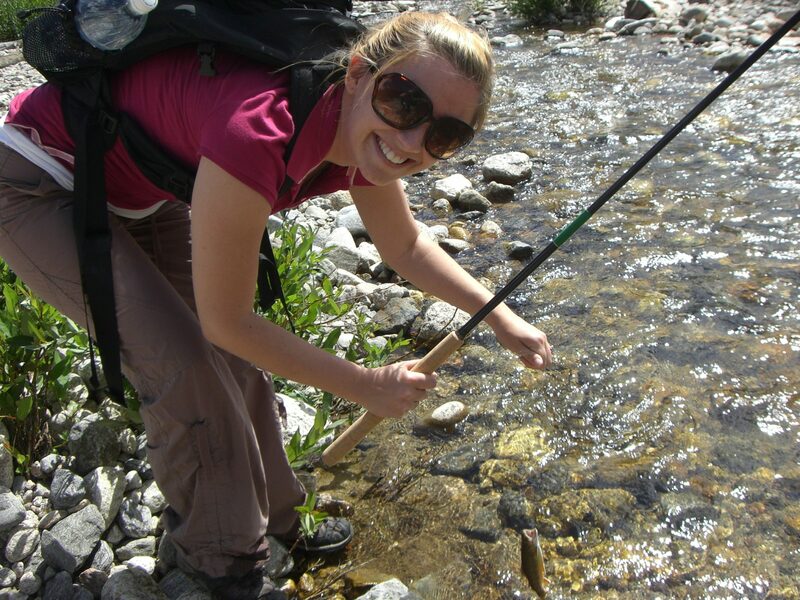 Fly fishing should be enjoyable–not torture. Most Astronauts are airplane pilots first. They don’t just jump into the Space Shuttle cockpit. They start by flying simpler aircraft and then learn the more complicated controls of a spacecraft. While the stakes for running before you crawl are obviously a lot lower when it comes to fly fishing, the same logic applies. Fly fishing is a wonderful and unique sport. It can change your life and become a lifelong passion. I wish I had known about Tenkara when I was learning to fly fish. It would have had a dramatic impact on my learning curve (not to mention my stress level). If you’re reading this, you obviously already do know about it. Just ask yourself this question: would you rather spend hours in a classroom learning technical jargon and the physics behind a cast or on the stream catching fish and having fun? Couldn’t agree more, Jason. I taught a class of 12 people once which was combined with a sustainable aquaculture class and dinner, so we only had two rods and two hours to fish. Almost everyone caught a fish and some two…and only one student had ever fished before at all! I remember one student after having caught a fish on a kebari asked me about the little pale bugs coming off the water and asked if I had any flies like it. I let him pick one he thought was similar out of my fly box and he naturally went into a crouch and caught a fish on a dry. He was well on his way to “getting hooked.” More dedicated anglers means more water conservation and restoration. 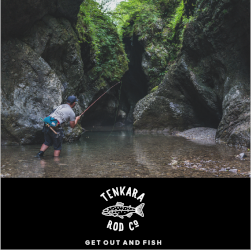 Start ’em off with tenkara and the fun begins right away! Hi Kevin, nice story. To me, that’s real learning. And you gave him a chance to use his own intuition rather than follow dogma. I think that is a more effective teaching style (and certainly more rewarding). 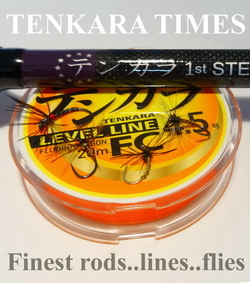 I came to fly fishing through tenkara, un-weighed by any experience with western style fly fishing. I was drawn to the simplicity and ultra light aspect inherent of tenkara and now find myself completely hooked (pun intended). Too true and sad to hear that people still do the traditional fly lessons and get discouraged by what they are doing. But if we can bring them to Tenkara then we can keep our waters free. I agree with Thom as well. I agree. Nothing wrong with western fly fishing but I think fishing with Tenkara teachs a lot on fishes, flies and rivers, avoiding useless staff, at list for beginners. 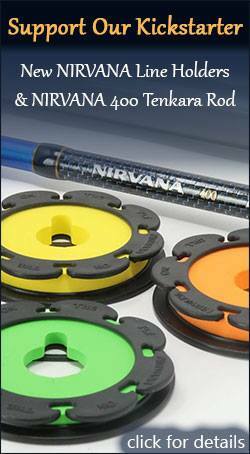 Learn tenkara fishing and then western fly fishing will be much easier to understand. Last weekend my dad found my old fishing rod and reel that I had lost for decades. I suppose I got to preoccupied as the years went by to take the time to relax by the lake and reminisce those early afternoons with grandpa. I did not realize it then but, there was a lot of wisdom shared in those mornings. I never took a fishing class, western fly or otherwise. They sound horrid. I don’t think you can damn a style of fishing because an industry of crappy instruction has grown around it. I’m sure you can all drone on endlessly about the theorys and science of tenkara as well. I agree with your point that the best instruction is on the water, and hopefully one’s lucky enough to get a few sagely pointers. My former guide father-in-law taught me more about dry fly fishing in an hour than I’d learned on my own in years. That build on what my father gave me in spin fishing. That is quality learning. There is no value in “10 and 2” and raw theory. In any style of fishing you need your equipment to be an extension of yourself. If you can cultivate that, avoid combat fishing, and relax then you will be successful. While I agree that Tenkara is easier to learn and a great option for kids, Tenkara oriented sites continue to exaggerate the cost and difficulty of western fly fishing. As a kid, I was able to catch fish my first day of fly fishing with a $40 Fenwick combo sans lessons. My 8 yr old son has an $80 Ross combo. He catches fish. I just purchased a brand new 8wt Redington pursuit combo for $80 on a great sale. It is impressive for the price and has a lifetime warranty from a company I know will be around if I should ever need to use it. 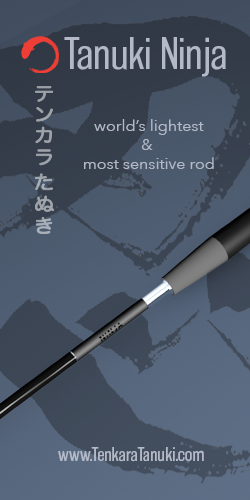 If anything, I find Tenkara rods to be overpriced. There is no reel seat or guides and very little construction (wrapping, epoxy, etc.) yet they cost as much or more than some great Western outfits. As far as learning, you can pull out a certain amount of line on a Western outfit and tell the beginner not to touch the reel. If that same beginner happens to hook into a 20 inch rainbow, that reel is going to come in handy. If he decides to chase steelhead, he’s gonna need a reel. To each his own. I primarily fish with a fly, but I’ve thrown my share of spinners and powerbait. As long as fisherman are good stewards to the water and fish, I could care less how they do it. Tenkara is awesome. Articles like this is why Tenkara fisherman are often compared to Hipsters. You don’t need to disparage one style to promote another. I know practically nothing about fishing, but after reading a lot of your posts here I am interested in trying out Tenkara. I don’t know anyone who does Tenkara, or any fly fishing in my area. Do you know of a good resource for learning from the ground up? Also, I know you usually just review some of the more well known brands, but I’m on a really low budget to start out and was considering going with this set off of amazon. It’s really cheap, but seems to have good reviews. Do you know anything about it?